Completed surveys should be returned to Mary F Coffey, Teagasc, Oakpark Research Centre, Carlow. COLOSS is an international research organisation established to monitor winter colony losses being experienced by beekeepers in many European countries and beyond. 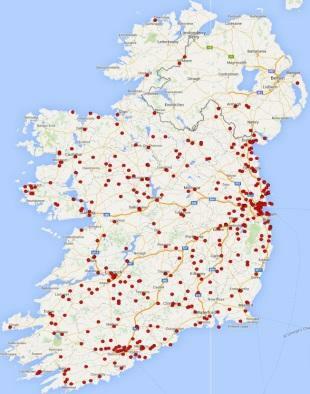 Since 2008, Irish beekeepers have actively participated in this survey. In 2017, as in previous years, the survey was disseminated in late April/early May using a variety of media including meetings, emails, An Beachaire, and online using the FIBKA and NIHBS webpages, with the aim of encouraging as many beekeepers as possible to participate and thus minimising bias. In all formats of the survey (printed/online) beekeepers were given the opportunity to complete the survey anonymously, but the name of the town closest to their apiary (main apiary if beekeeper had more than one) was an essential question. Achieving proper representation of the beekeeper population is difficult but essential if the estimation of loss rates is to be reliable. Colonies lost due to natural disaster. The analysis of the international dataset from previous years identified a number of factors which were potentially contributing to increased winter losses and include operation size, insufficient control of Varroa, age and quality of queen and forage crops used. To verify these findings, the 2017 survey also included questions on operation size, beekeeping management techniques (for example changing foundation, age of queens, migration) and the Varroa treatments administered, if any, to the colonies. 403 beekeepers completed the 2016/2017 survey of which less than 2% were incomplete or invalid. 37% of beekeepers completed the printed version (mostly from An Beachaire) while the online response rate reached 62%. As indicated on the map (Figure 1), the response showed a good geographical spread with beekeeping community represented to some extent in most counties. However, as in previous years, a total of 12 counties (Table 1) had fewer than 10 responses. Such a low response rate limits the type of analysis; hence, in these 12 counties the mean winter losses was not estimated as the result would be unreliable. Figure 1: The geographical distribution of respondents in the 2016/2017 annual survey on winter colony losses. In 2016/2017, the national average winter colony loss experienced by beekeepers was 13.3%: 8% due to unsolvable queen problems, 5% due to colonies dying out and 0.3% due to natural disaster. 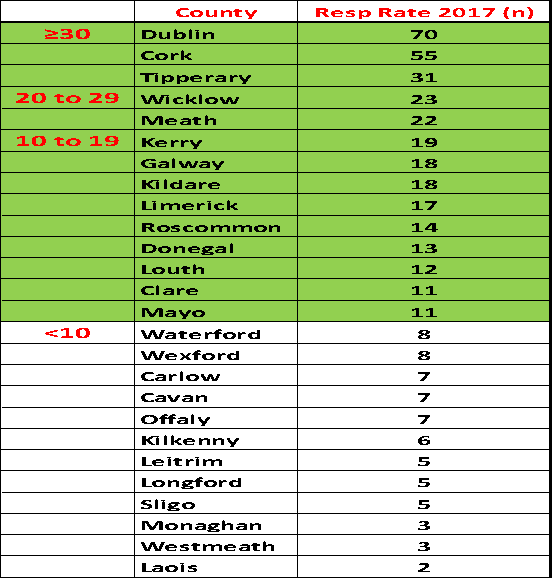 Exceptional winter losses in Cork (24%) and Kerry (22%) exceeded the study average of 13% (Figure 2). Figure 2: The mean winter colony losses in counties that the response rate was more than ten respondents. This is the first year that a separate number of colonies lost due to natural disaster were presented. In the Irish context natural disasters refers to flooding, wind, fallen trees, cattle/sheep, vandalism and theft. However the low percentage losses being attributed to natural disasters suggests that like beekeepers in many parts of Europe and in the US, Irish beekeepers perceive that natural disasters have a negligible effect on increased winter colony losses. In contrast, Irish beekeepers perceive queen problems as the main contributing factor to increased winter colony losses. In 2015/2016, 12.5% of colony losses were attributed to queen problems and again this year 8% were attributed to queen problems. The COLOSS study average for losses due to queen problems was approximately 5%. Considering the annual trends in winter colony losses, Figure 3 shows winter losses in 2016/2017 was significantly lower than losses experienced by beekeepers in 2015/2016 2012/2013, 2008/2009 and 2009/2010, while similarly low losses were reported by beekeepers in 2011/2012 and again in 2013/2014. The black line (Figure 3) indicates the percent colony losses (15%) which beekeepers consider acceptable, at least since the arrival of Varroa mite in 1998.